Dig. Peterborough, NH: Cobblestone Publishing Company, August 2010. Print. Dig. Peterborough, NH: Cobblestone Publishing Company, June 2010. Print. Dig. Peterborough, NH: Cobblestone Publishing Company, October 2009. Print. Dig. Peterborough, NH: Cobblestone Publishing Company, September 2009. Print. With bright colors and intriguing questions, dig invites it's target tween audience to dig into archeology. As part of the Cricket series of magazines for children and younger teens, dig has a definite educational slant. 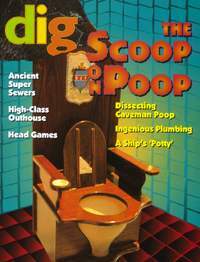 As a consequence, dig is more text heavy than many other magazines for tweens, but each issue encourages even casual readers to dig in by beginning with smaller facts and blurbs and then gradually leading into longer articles. While it is mainly intended to be informative and accurate, dig often succeeds in doing so in entertaining ways. Each issue is focused around a particular question or theme, such as Pompeii or what people ate throughout the ages, around the word. While some topics, such as dinosaurs, are more likely to appeal to younger children than teens, many of the topics - such ancient toilets - explore the types of questions that most intrigue tweens. All while maintaining a sense of humor that is almost certainly to be absent in their textbooks. Jokes and odd, unexpected finds and facts can be found in each issue, and also encourage tween readers to explore the past - and the science that makes studying the past possible. While this text heavy magazine is unlikely to be especially appealing to the most reluctant of readers, the magazine format will likely encourage many kids to explore more academic topics than they might otherwise. This is a great magazine to display alongside thicker non-fiction books or to have on hand to help make research projects less daunting.